Timely action taken by a father enabled him to save the lives of his wife, two children aged six and nine years and himself from a fire which engulfed their residence on the uppermost sixth floor of a business institution at Yatinuwara Street, Kandy around 7 am yesterday. As the fire spread fast and enveloped the escape route the lives of the four family members depended on providence. 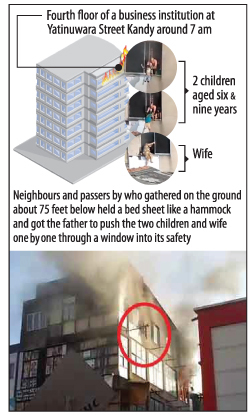 Soon neighbours and passers by who gathered on the ground floor about 75 feet below held a bed sheet like a hammock and got the father to push the two children and wife one by one through a window into its safety. The father too later came out of the window and climbed down to safety. However, all four who received minor injuries during the ordeal are now receiving treatment at the Kandy hospital. The Kandy Municipal Council fire brigade and Police which rushed to the scence later doused the fire before it spread to the other floors. The cause of the fire has still not been ascertained. Kandy Police is investigating. A fire which broke out in Kandy this morning caused extensive damage to a building. 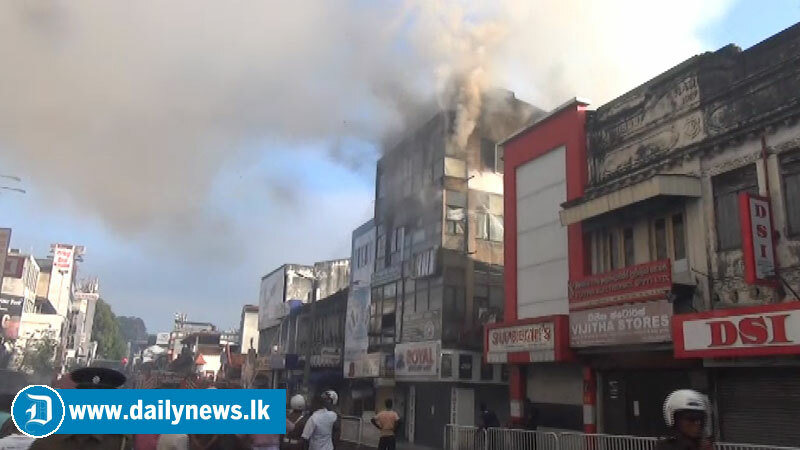 The fire broke out in a building at Yatinuwara in Kandy. They said four fire trucks have dispatched to douse the fire. Fire trucks and the public managed to bring the fire under control.